You are here: Home / Blog / Cancer news / What is Kaposi Sarcoma? Kaposi sarcoma is rare type of cancer that causes tumors to form in the skin; mucous membranes lining the mouth, nose, and throat; lymph nodes; or other organs. Tumors caused by the disease are usually purple and are made of cancer cells, new blood vessels, red blood cells, and white blood cells. Most cancers begin in one part of the body and spread to others; in the case Kaposi sarcoma, lesions may begin in more than one place in the body at the same time. Kaposi sarcoma of the skin. Creative commons image. Doctors use tests that examine the skin, lungs, and GI tract to diagnose the cancer. Once diagnosed, additional tests are performed to determine if cancer has spread to multiple points in the body. 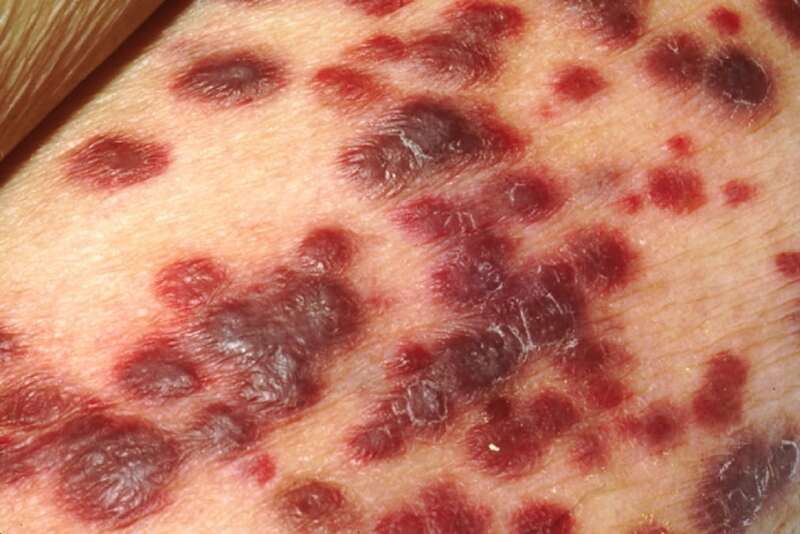 Kaposi sarcoma is caused by a virus called human heresvirus-8 (HHV-8). All patients who develop the disease are infected with the HHV-8. However, most people infected with HHV-8 do not get Kaposi sarcoma. People who are infected with HHV-8 who also have weakened immune systems, often caused by disease or immunosuppressive therapy (such as drugs administered following an organ transplant), are more likely to develop Kaposi sarcoma. Typically, the prognosis and treatment options for patients with Kaposi sarcoma depends on the type of the disease the patients has, the overall health of the patients, especially as it concerns the immune system, and whether the cancer has just been diagnosed or has been treated and then come back. https://treatcancer.com/wp-content/uploads/2015/12/Kaposis_Sarcoma_Lesions.jpg 675 1012 Southeast Radiation Oncology Group, P.A. https://treatcancer.com/wp-content/uploads/2015/08/SERO-logo-PNG-450x174.png 2015-12-05 23:48:272018-10-11 19:42:15What is Kaposi Sarcoma?